It takes nearly 4 days to prepare the ingredients for each menu item. Every menu item is prepared on site using recipes from our Sangha, past and present. Our next food fundraiser will be our May 17 Chicken Teriyaki Take-out dinner. More information to come! Community Shopping Day is a special shopping day event that offers the opportunity for nonprofit organizations in select communities to raise funds in their local communities. It is a unique opportunity to fundraise in a different way. This is the second year that the Pasadena BWA will participate. All proceeds from our sales of this tickets go to the BWA and if we are amongst the top sellers, makes us eligible to share in a percentage of total sales on that date. 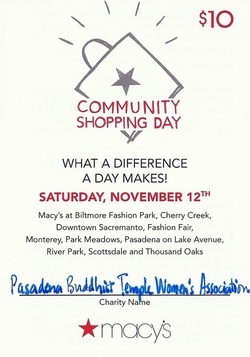 Community Shopping Day will be held November 12, 2011 at select stores in Arizona, California, and Colorado. Community Shopping Day tickets entitle Macy’s guests to exclusive 10 to 20 % savings plus an additional $10 off of one purchase of $25 or more during the pre-sale period and on the day of the event at Macy’s participating stores only. The difference between these tickets and other Macy’s offers is that there are next to no exclusions! You can buy much MORE than you could if you were using a regular Macy’s coupon! And… All supporters that buy a ticket from participating organizations can enter a drawing for a chance to win a $500 Macy’s shopping spree (must be returned on event day at the specially designated turn-in table).